ST. PETERSBURG, Fla. -- Asheville Tourists shortstop Rosell Herrera, who was named the South Atlantic League's Topps Player of the Month for May, and Grand Junction outfielder Raimel Tapia, who recently had a 29-game hitting streak, are among those who have been honored with their leagues' July Topps Player of the Month award. The Topps Company of New York, N.Y., in conjunction with Minor League Baseball™, announces the winners. J.D. Martin (30) of North Las Vegas, Nev., went 4-0 with a 1.39 ERA for the Durham Bulls. The right-hander tied for the most wins last month in the International League and ranked third with a .087 WHIP. In five starts, spanning 32 1/3 innings, Martin walked just three and struck out 25. The Tampa Bay Rays signed Martin as a free agent in January. Kole Calhoun (25) of Buckeye, Ariz., led the Pacific Coast League with a 1.174 OPS and finished second with a .708 slugging percentage. The Salt Lake Bees outfielder ranked third with a .382 batting average, 15 extra-base hits and a .466 on-base percentage. Calhoun had hits in 17 of his 22 games, before the Los Angeles Angels of Anaheim, who drafted him in the eighth round in 2010 out of Arizona State University, promoted him to the Majors on July 28. Alex Dickerson (23) of Poway, Calif., hit .413 with six homers and 27 RBIs for the Altoona Curve. The outfielder led the Eastern League in eight offensive categories, including average, hits (43), RBIs, runs (23), slugging percentage (.683) and OPS (1.123). Dickerson had more than one hit in 14 of his 26 games. The Pittsburgh Pirates selected him in the third round in 2011 out of Indiana University. Marcus Semien (22) of El Cerrito, Calif., hit .372 with eight home runs and 20 RBIs for the Birmingham Barons. The shortstop led the Southern League in batting average, runs (28), walks (29), hits (35), extra-base hits (18), total bases (70), on-base percentage (.524), slugging (.745) and OPS (1.269). The Chicago White Sox, who drafted Semien in the sixth round in 2011 out of the University of California-Berkeley, promoted him to Triple-A® at the beginning of this month. Max Stassi (22) of Yuba City, Calif., had a very strong month for the Corpus Christi Hooks. The catcher led the Texas League in almost every power category, including homers (11), total bases (68), OPS (1.185), RBIs (24) and slugging percentage (.782). Stassi also ranked in the top five in extra-base hits (16), batting average (.333) and on-base percentage (.404). The Houston Astros acquired him in a February trade with Oakland. Scott Schebler (22) of Solon, Iowa, also had a powerful July, leading the California League in home runs (11), RBIs (29) and extra-base hits (20). The Rancho Cucamonga Quakes outfielder also paced the league in runs (29) and total bases (85). Schebler ranked second in slugging (.739). OPS (1.134), hits (40) and triples (3). The Los Angeles Dodgers selected him in the 26th round in 2010 out of Des Moines Area Community College. Billy Burns (23) of Atlanta, Ga., had hits in his first 18 July games on his way to a Carolina League-best .359 batting average. The Potomac Nationals outfielder tied for the league lead with 13 stolen bases and finished in the top five in on-base percentage (.443), hits (33) and OPS (.922). The Washington Nationals took Burns in the 32nd round in 2011 out of Mercer (Ga.) University. Jonathan Rodriguez (23) of San Juan, P.R., paced all Florida State League batters in homers (6), RBIs (28) total bases (59), slugging (.663) and OPS (1.104). The Palm Beach Cardinals first baseman ranked second with his .382 batting average and 13 extra-base hits. The St. Louis Cardinals drafted Rodriguez, who recorded hits in 19 of his 25 games, in the 17th round in 2009 out of Manatee (Fla.) Community College. Nick Rickles (23) of Loxahatchee, Fla., finished first in the Midwest League with a .400 batting average, second in OPS (1.039) and third in slugging (.624). The Beloit Snappers catcher had hits in 18 of his 22 games, including 10 multiple-hit contests. Rickles had his best day on July 27, when he went 5-for-5 and just missed hitting for the cycle by a triple. The Oakland Athletics selected Rickles in the 14th round in 2011 out of Stetson (Fla.) University. Rosell Herrera (20) of Santo Domingo, D.R., won the South Atlantic League honor for May when he hit .324 with five homers and 24 RBIs. Teammate Tom Murphy took home the award for June. Last month, Herrera led the league in batting average (.391), hits (36) and tied for the lead with 13 extra-base hits. The Asheville Tourists shortstop finished second in OPS (1.049) and slugging (.598). The Colorado Rockies signed Herrera as a free agent in July 2009. Harold Ramirez (18) of Cartagena, Columbia, hit .384 with 22 runs, 43 hits and 28 RBIs, all tops in the New York-Penn League. The Jamestown Jammers outfielder ranked second with a .440 on-base percentage and 59 total bases and was third in stolen bases (11) and OPS (.967). The Pittsburgh Pirates signed him as a non-drafted free agent in July 2011. Lars Huijer (19) of Hoofddorp, Netherlands, went 5-1 with a 0.82 ERA for the Everett AquaSox. The right-hander tossed 33 innings and led the Northwest League in wins, ERA, WHIP (0.70) and average against (.125). Huijer ended July with a 23 1/3-inning scoreless streak, allowing just one hit in each of his last two starts, which lasted seven and eight innings, respectively. The Seattle Mariners signed him as a non-drafted free agent in June 2011. Kenneth Peoples-Walls (19) of Los Angeles, Calif., was among the top five Appalachian League hitters in triples (3), slugging (.538), homers (4), total bases (50), extra-base hits (12) and runs (17). The Johnson City Cardinals shortstop had five three-hit games, including four in a row from July 7-11. The St. Louis Cardinals drafted Peoples-Walls in the fourth round in 2011 out of high school. Raimel Tapia (19) of San Pedro de Macoris, D.R., hit in all 25 of his July games as part of a 29-game hitting streak. 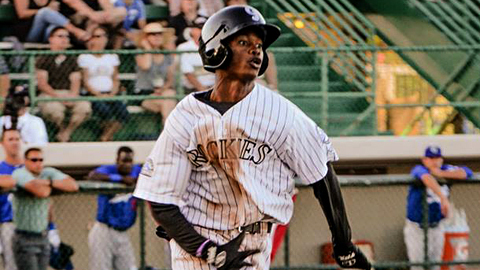 The Grand Junction Rockies outfielder led the Pioneer League with a .417 average and 43 hits. Tapia ranked second in total bases (65) and on-base percentage (.446) and third with a 1.077 OPS. The Colorado Rockies signed Tapia as a non-drafted free agent in November 2010. Kevin Garcia (20) of San Francisco, Zulia, VZ, hit .388 with a pair of homers and nine RBIs for the Reds. The outfielder finished second in the Arizona League with 31 hits, third in average and fourth in OPS (.954) and slugging (.538). Garcia had at least one hit in 14 of his 21 games. The Cincinnati Reds signed Garcia as a non-drafted free agent in October 2011. Reese McGuire (18) of Covington, Wash., started his professional career by going 4-for-5 with two doubles and three RBIs on July 4. The Pirates catcher hit .369 last month; good for third best in the Gulf Coast League. He had hits in 16 of 21 games and ranked second in the league with nine doubles and fourth with 31 hits. The Pittsburgh Pirates drafted McGuire with their second first-round pick (14th overall) in this year's draft out of high school.